I have always loved the book that I chose to highlight this week. It is The Rainbow Fish by Marcus Pfister. 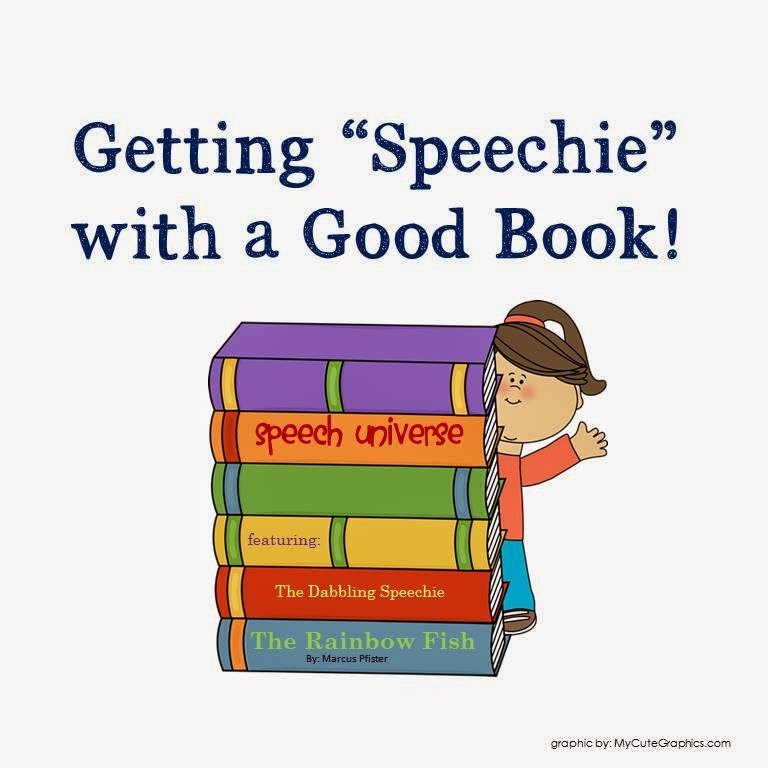 The book companion I used is The Rainbow Fish Speech and Language Activities by The Dabbling Speechie. This packet is absolutely chock full of activities for you to do with your students after you read the book! Included are also some definition sheets for the multiple meaning words, and pre-test/ post-test sheets for vocabulary. This includes lots of pictures for describing and naming ocean animals. Visual cards for story re-tell. Picture sequence cards of the story details to help with story re-tell. Comprehension question sheets and story elements bookmark. Pre-test/post-test data sheet to assess a student's ability to recall the story elements from the story. Visual sentence strips for students to talk about the story. Sorting mats and stimulus cards for is/are practice. Matching activities for the concepts small/big and colors. Preposition activities and sorting mats. Prepositions targeted are in front, behind, above, below, far, and between. Identifying situations to determine if children are sharing or not sharing. There are two cute coloring sheets that you can use to make glittering rainbow fish. There are two writing sheets with story starters. This was a great packet to work with this week! Even though I had a shortened week, I was able to use a few of the activities for two days. My students really liked the activities! The graphics are super cute, and the activities are so relevant to goals that we are working on. You can check out this great packet HERE!